To have been alive during the last sixty years is to have lived with the music of Paul Simon. The boy from Queens scored his first hit record in 1957, just months after Elvis Presley ignited the rock era. As the songwriting half of Simon & Garfunkel, his work helped define the youth movement of the '60s. On his own in the '70s, Simon made radio-dominating hits. He kicked off the '80s by reuniting with Garfunkel to perform for half a million New Yorkers in Central Park. Five years later, Simon’s album “Graceland” sold millions and spurred an international political controversy. And it doesn’t stop there. Peter Ames Carlin is a writer and the author of several books, including Bruce, a biography of Bruce Springsteen published in October, 2012. Carlin has also been a free-lance journalist, a senior writer at People in New York City, and a television columnist and feature writer at The Oregonian in Portland. A regular speaker on music, art and popular culture, Carlin lives in Portland, Ore., with his wife and three children. "You hold in your hands a book just as epic and fine as "Sound of Silence" or "American Tune." Peter Carlin has gotten it all down, the partnerships, the comedy, the heartbreak and triumph of Paul Simon, who might well be the one who lasts. And it's not just the words—it's the music, that is, the sharp clarity of Carlin's writing that keeps the pages flying. The great gift of Homeward Bound is to let you hear Paul Simon's great catalog of tunes all over again, as if for the first time." "The world of pop music has paraded its own mythologies for decades, insisting that art and business can be separated, that authenticity is the condition of the greats, that politics is as easy as a statement made from a stage. But the truths are different: art and commerce are regularly in unflattering bedroom situations, the greats spend much of their time adjusting masks, and politics only begins with a protest song. 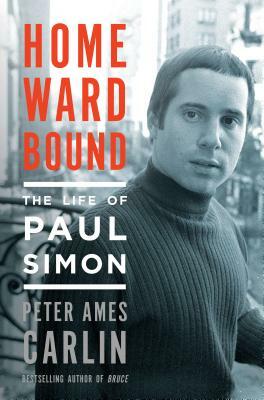 The case of Paul Simon, presented here by Peter Ames Carlin with an admirably even tone and unabashed skill, pushes these truths out front. Homeward Bound is a book you should read if the ruckus you hear behind those soaring melodies is of interest, as it should be." "Carlin achieves a satisfying balance across every decade of Simon’s life.Carlin also diagrams his subject’s personality in a way that fully informs and illuminates the music. Be advised: You’ll want to have Simon’s recordings on hand as you read Carlin’s engrossing account of how they got made—and with the road map he provides, you’re bound to hear something you never noticed before." "[Homeward Bound] offers a sweeping panorama of the singer-songwriter’s life story...favoring a psychological approach to understanding its subject’s lifelong conflicts, ... [it] provide[s] a picture of a man struggling with the binary tensions of post-immigrant, postwar Jewish life in America."